Myths and legends often begin with a fantastical setting and a mysterious occurrence which happens only once in a blue moon. Oftentimes, the stories go, if you’re in the right place at the right time, you might be one of the lucky few that bear witness to one of these spectacular happenings. That being said, let me tell you about a magical event that only happens once a year where game designers of legend come together to display their marvelous creations to an unsuspecting world; a gathering… called Essen Spiel. And, if you’re lucky enough to be there at the right time, you just might find Uwe Rosenberg demonstrating a new creation. This past Essen Spiel was just such a time. This year the stars aligned and the Fates intervened. 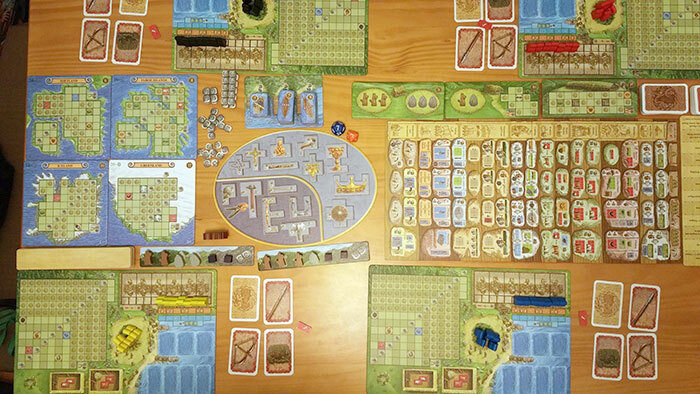 This year Uwe Rosenberg found his muse and the final product of his efforts was given unto the world: A Feast For Odin. In A Feast For Odin, you take on the role of a group of Vikings as they work to increase their holdings and prestige. This is accomplished through raiding and pillaging, exploration, animal husbandry, and trading. Each turn, the players are provided with a set of limited actions to choose from. But once an action has been taken, it is no longer available for use. People that have played any of Uwe Rosenberg’s past games (Agricola, Caverna, or Fields of Arle for example) will find this to be very familiar. In order to emerge victorious as the most powerful Viking, it is going to take efficiency, planning, strategy, and a little bit of luck. 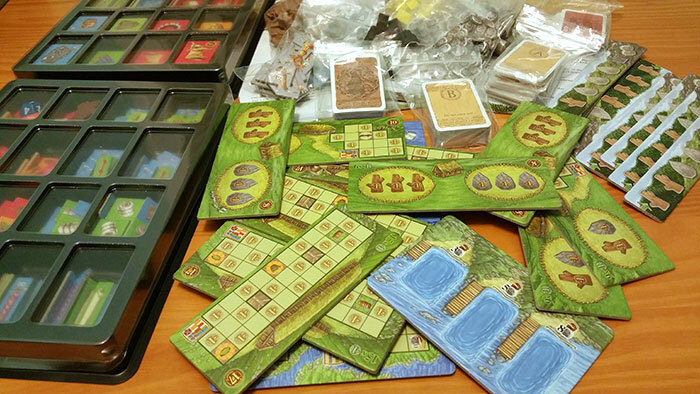 A Feast For Odin is a very hefty game (weighing in at almost 8 pounds!) that comes packaged inside of a very large box. Opening the game can feel very overwhelming at first because the box is jam-packed with components. There are four home boards, an action selection board, a turn summary/tracking board, mountain strip tiles, house boards, an oval ‘special tiles’ board, occupation cards (3 decks of them), a deck of weapon cards, goods tokens, animal tokens, silver tokens, two dice (an orange 8-sider and a blue 12-sider) and a whole bevy of wooden Viking meeples and wooden resources pieces. The box is jam-packed with components. The quality of all of these bits and pieces is incredibly good with the exception of the occupation and weapon cards. They’re not super thin, but they’re not of the highest quality either. I can see these getting worn down and fading over time if you don’t get them sleeved early on. Instead of focusing too much on the various components, I will introduce them as they become relevant during the course of this review. Each player will choose a color and take all of the Vikings of their chosen color. Then they will each receive a home board and place their Vikings along the banquet area at the top right so that all of the numbers are covered. The remaining Vikings are placed into the Thing* area. Each player also receives a spear, a snare, and a bow and arrow weapon card (which are kept face up in front of them), a single mead goods tile, and a starting Occupation card (which is kept hidden). There will always be two mountain strips turned face up at the start of the game. These are filled up with the appropriate items. 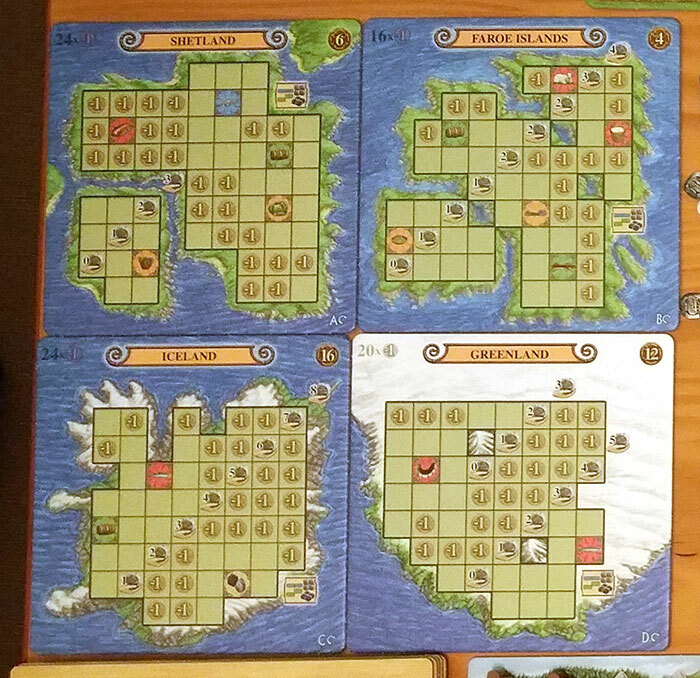 The four Exploration (Island) tiles are turned face up so that the letters with the flip symbols are in the bottom right corner of each. These should be arranged in alphabetical order by the letters that accompany the flip symbol. The turn marker cube is placed onto the turn summary/tracking board in position one. Finally, a start player is determined by some means (I suggest just rolling one of the dice) and handed the starting player moose. *A Thing was an assembly wherein the men of the Viking community would meet to create laws and decide cases. 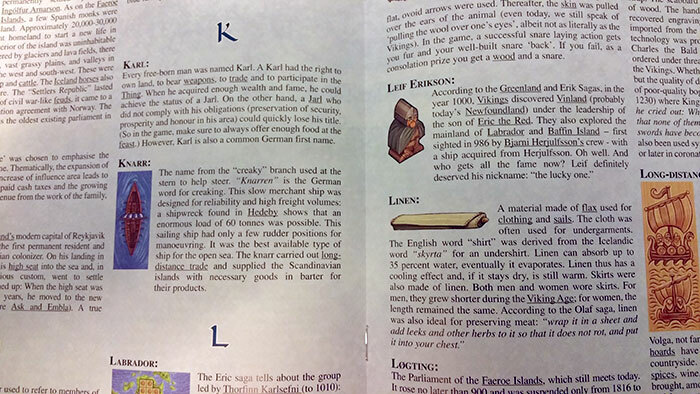 This and a lot of other intriguing historical information is presented in the Almanac of the game which is also included in the box. A turn in this game consists of 12 sequential steps and several “anytime” actions. Each player begins the turn by moving the leftmost Viking from their banquet table to their Thing area. Next, players enter a Harvest phase in which players will receive food for the round. Then, depending upon the turn number, one of the Exploration boards will be turned over to its opposite side (if it is still unclaimed). After those upkeep steps comes the action selection. During action selection, beginning with the start player, players will take turns placing their Vikings onto the action selection board and then taking those actions. The action selection board is divided into four columns and multiple rows that have been divided by general categories (food acquisition, raiding and pillaging, etc.). If a player chooses to take an action from column one, they will only need to place a single Viking to do so. If they choose to take an action from other columns, they will have to devote more of their Vikings. The number of Vikings needed depends entirely upon the column. Each column uses one more Viking than the previous one does. After every player has used all of their Vikings (or passed) then the last person to place Vikings becomes the new start player. 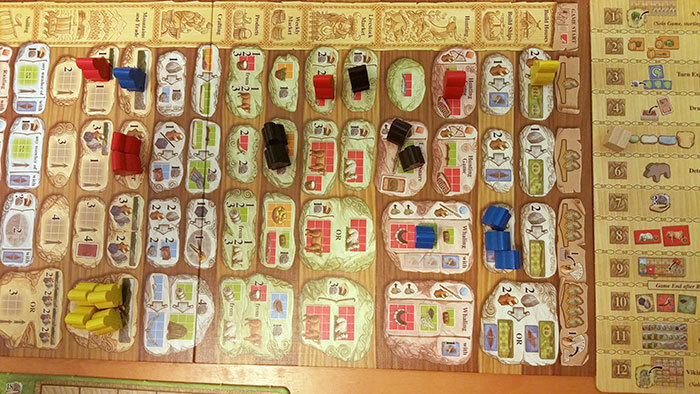 After action selection, players receive income, animals breed, and the players feed their Vikings. The banquet table is divided into several small sections and each of these sections must be covered at this time in order for the Vikings to be fed successfully. Only red tiles, orange tiles, and silver tiles can be used to do this. Feeding the Vikings requires players to follow some very specific rules. Orange tiles can never touch each other and neither can red tiles. Silver pieces may be used to fill spaces and can touch one another. The various tiles are initially laid down horizontally, but if multiple copies of the same tile are used, then the extra ones must be laid down vertically (inefficiently). Once everyone is done feeding, the tiles used to do so are returned to the supply. After the banquet, players receive bonuses (if eligible), the mountain strips are updated (the leftmost item is removed from each), and a new mountain strip is introduced. 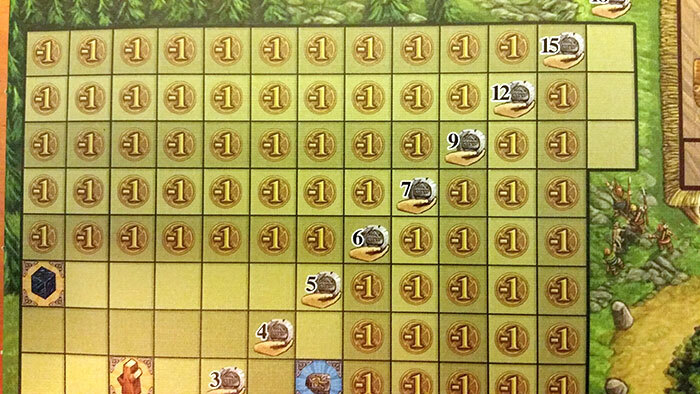 Once these upkeep steps are complete, the players gather all of their Vikings and get ready for a new turn. While this might seem like a lot of stuff to do, once you’ve played a round or two, things move along fairly quickly. This game is largely about spatial management. Each player begins the game with a large number of negative points on their home board. Throughout the course of the game, players are given the opportunity to cover these spaces with the goods that they have acquired. 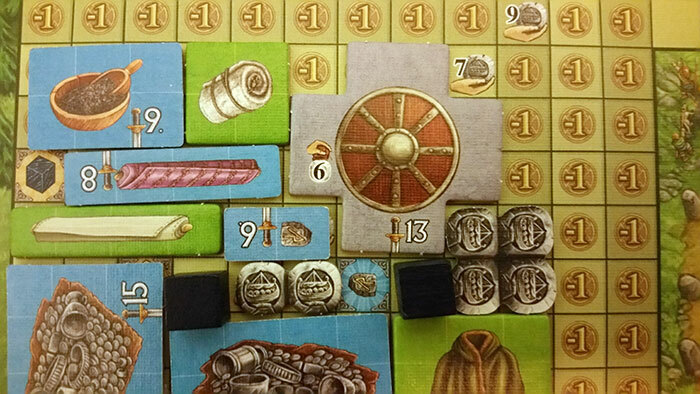 Players will also have the opportunity to expand their holdings using the various House tiles and Exploration boards. The downside is that taking these on also takes on extra negative points. However, if the player is able to negate these negative points (i.e. cover them up with goods) then these extra holdings can be worth a hefty amount of points when the scores are tallied at the end of the game. A veritable sea of negatives. But simply having to cover up spaces would be much too simple. In the opposite corner of the board is the income diagonal and interspersed all throughout the various boards are bonus spaces. These all serve to complicate things and force the players to have to make tough decisions. During the income step of the turn, players will receive an amount of silver equal to the lowest uncovered number of the income diagonal on their various boards. But, in order to cover up a number to increase their income, all of the spaces to the left of that number, the spaces directly beneath that number, and the area that is encapsulated by these spaces must be covered first. Some of these spaces have different icons already printed on them that correspond to the various game resources (i.e. stone, wood, ore, etc.). For the purposes of income, these ‘bonus spaces’ are considered to already be covered. While it is possible to cover these bonus spaces, it may not be desirable since they yield the pictured bonus if completely surrounded during the bonus step. Just like the banquet table, covering these spaces follows very specific rules depending upon which board they are on. For instance, on the home board, orange and red tiles may not be used; green tiles may not touch one another; while blue tiles, ore, and silver pieces can. It is this balancing act of increasing income while also negating those negative points that drives the strategy in this game and creates the real challenge. The 7 may not be covered because the space a few spaces to the left of it has not been covered yet. In any of these cases, choosing the action will allow you to roll a die and then use certain resources in conjunction with specific weapon cards to either increase or decrease your die roll to ensure success or to increase your overall power. In the case of hunting or whaling (which requires you to possess a certain type of boat), your goal is to roll low because you’re going to have to pay some combination of resources equal to the number on the die in order to succeed. There are some goods and items in the game that feature a sword icon and a number. These goods and items can be obtained through multiple means, but one of the best ways to obtain them is by raiding and pillaging. Raiding and pillaging, like whaling, require you to possess a certain type of boat before the action can be used. When utilizing these actions, your goal is to roll high and you can then use some combination of resources to increase your result. The higher the final number, the larger the goods and items that you can purchase from the supply. If you should fail to achieve success with any of these actions, you will always get back some combination of resources and weapon cards (and in some cases some of your Vikings). There is a lot more to this game than I have covered here. This is just a brief overview to give you a general idea of how the game is played. The first playthrough can feel a bit overwhelming. There’s a lot going on here and just like many euros, you are not going to be able to do all of the things that you want to do. For some, this might be an automatic no-go, but for me, it’s a major draw. I really enjoy worker placement. I am very into heavy euros. I love Uwe Rosenberg. For me, this game puts a check in every box. Thematically, this game has got it going on. Rosenberg’s love for the subject matter shines through every aspect of the game. The inclusion of the Almanac just seals the deal. I am a sucker for these kinds of little extras. Lewis and Clark did something similar and the old Age of Empires computer games were jam packed with all kinds of interesting historical data. It’s not often that you encounter a game that is also educational, but this is one of them and I love that. The Almanac is almost as interesting as the game. Gameplay-wise, this game is very well put together. Each placement of your Vikings forces you to make some agonizing decisions. For instance, choosing the fourth column actions comes at a heavy cost. Taking those actions early will use up your Vikings at an accelerated rate leaving your opponents with the run of the board unhindered. However, if you put it off, there’s always a chance that it won’t be there when you’re ready to take it. Should you or shouldn’t you? In the case of whaling, for instance, the payout for a successful whaling trip is quite substantial and the cost of failure isn’t very steep. Even if you fail, you still get a few resources to help on future whaling expeditions and you get a few of your Vikings back. This can be especially useful if you’re attempting to jockey for position so that you can take the starting player marker. However, if you’re hoping for a failure but wind up with a success, you could effectively knock yourself out of the rest of the round giving your opponents unfettered access to whichever actions still remain. Multiply this kind of decision making by the sheer volume of available actions and you’ve got the recipe for a game that never ceases to be challenging and interesting. Because of the sheer number of decisions and the large number of negative points staring you in the face from the get-go, some turns can turn into particularly long ones as you and your opponents try to parlay your actions into goods as efficiently as possible. I suppose you could consider this a negative. But, while analysis paralysis can be frustrating in some games, it’s almost welcome here as it provides you extra time to try to develop a strategy while other people are thinking out theirs. Another thing that could be considered a drawback is that there is very little direct player interaction. All of the action takes place on the action selection board and while it is possible to get in someone else’s way, there’s no way to outright attack them directly. So, if you’re the type of person that prefers a little warfare to your games, the lack of it here could be a turnoff for you. Also, be aware that this games uses up A LOT of table space. If your gaming space is at a premium, then this game might not be a good fit because you are going to need a good deal of room in which to play it. I, however, am not dissuaded. I love the challenge and the puzzle that this game brings. I love the gameplay. I love all of the tiny little pieces. I love the artwork and the history. I just love it. And that is why A Feast For Odin gets my seal of approval. If you haven’t played this one yet, then you’re missing out. 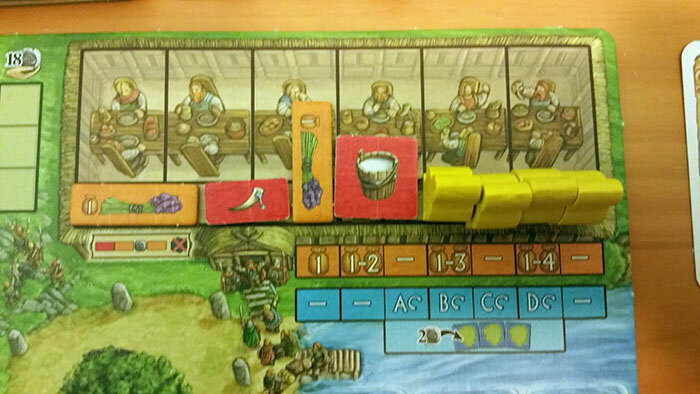 What do you think about A Feast for Odin? Give us your opinions about what you like and/or dislike about the game in the comments below!